In the summer of 2013 I visited a potential client in Clapham London to look at how they could reclaim their outdoor space. Read on for insight into the garden design and installation of this small, contemporary, urban garden. Effective design of small spaces is a subject gaining increasing media coverage of late. Micro living looks at achieving affordable and often more sustainable housing whilst numerous tv shows look at de-cluttering our lives and making the most of what space we have. Design of space is just as important in our gardens in order to achieve effective functionality while retaining aesthetic appeal. 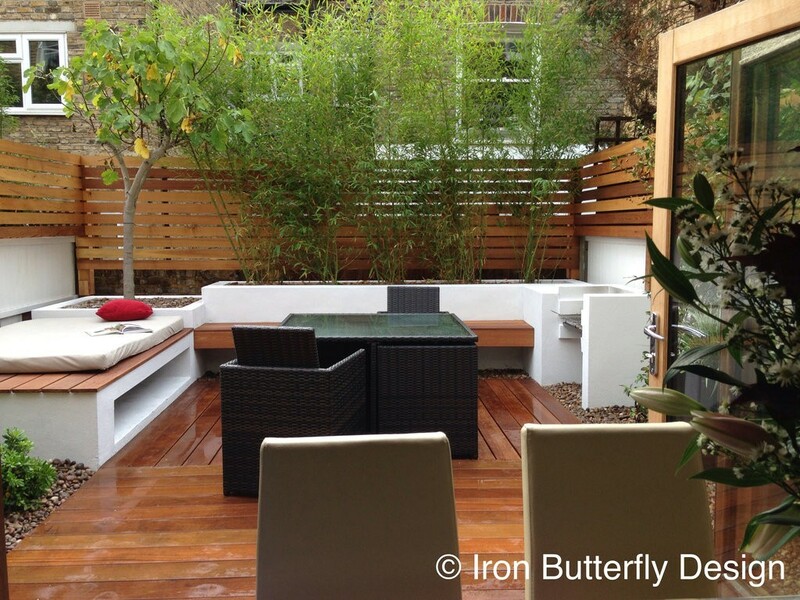 In this London garden the space was limited and it was vital to make the maintenance manageable for the busy owners. The garden had a few issues to overcome. It was being dominated by an existing hedge that had grown very tall and wide. There was a ground cover of gravel right up to the house meaning that it travelled into the kitchen on feet. There were no notable features to draw you into the space. Matt and Eleri wanted to be able to entertain their friends in the space with Summer barbecues. They also wanted space to recline and relax without dragging furniture in and out. The design solution was to create a series of built-in beds, seats, barbecue and daybed, these would all be rendered and painted to give cohesion. The surfacing would be a hardwood decking which would be repeated on the bench and daybed. This would feel great underfoot on a summers day. The tired fencing on one boundary would be replaced and new slatted style fencing would be introduced from the top of the existing fence to a height of 2m. 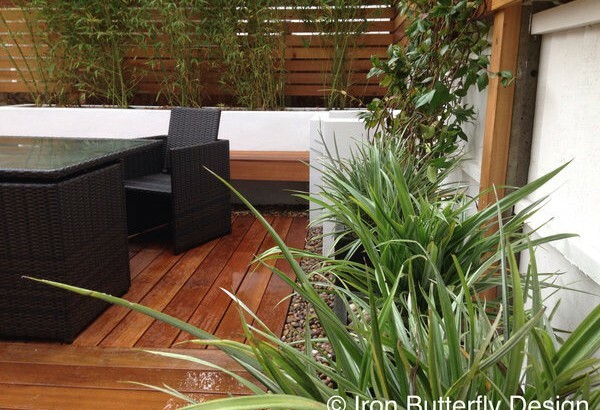 In the rear planter bamboo would give privacy to the overlooked garden allowing light to enter the garden. A restrained low maintenance pallete of evergreen perennials and a standard fig would give the garden a unfussy feel.